A ceremony to commemorate the 2,565th anniversary of the birth of the ancient Chinese philosopher Confucius was held at the over-700-year-old Confucius Temple in Beijing, Sept 28, 2014. More than 500 people, including heads from all walks of life, experts, followers of Confucianism from Russia and the US, and the general public attended the event. Kong Deyong, 90, a 77th-generation descendant and head of the World Federation of Confucius Descendants also joined the ritual. Some of the participants took part in a series of procedures such as bowing to the statue of Confucius, Ba Yi dance, an ancient dance that started in the Zhou Dynasty (c. 11th century-256BC), and offering wine to Confucius. Students from Guangqumen Middle School chanted paragraphs from Confucian classics. 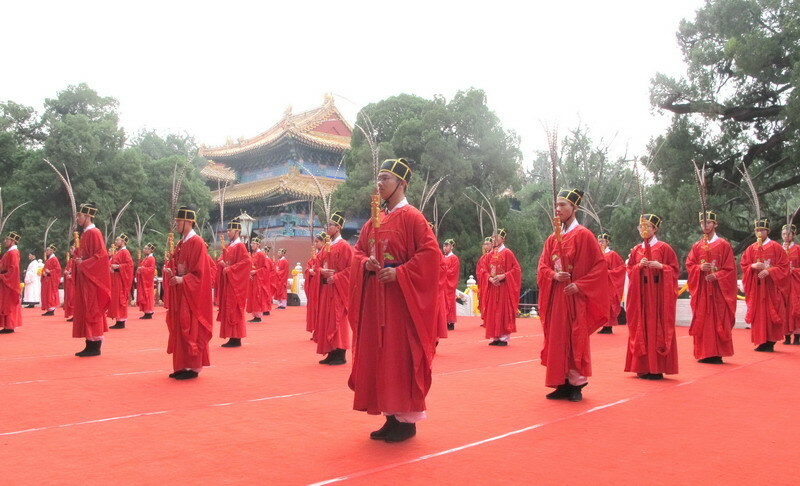 "We hope that through the ritual with solemn procedures, traditional Chinese music, Han and Tang style clothing worn by participants, people can feel the holiness and charm of Chinese cultural tradition", said Wu Zhiyou, director of the Confucius Temple and Imperial College Museum.